The interior space has been extensively re-conceived through essential design interventions and the employment of minimal materials. This was accomplished by retaining fragments of the original structure with the addition of contemporary elements. 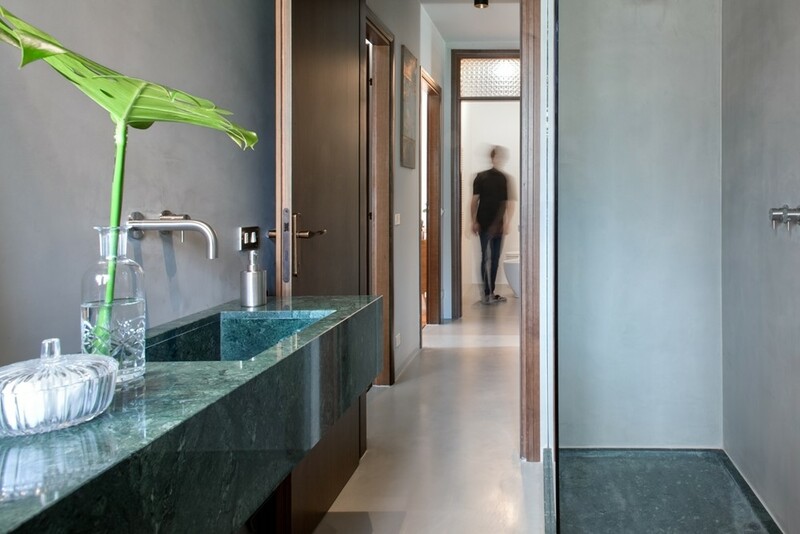 The dialog between warm-shaded components such as dark wood doors, dense-slatted parquet, retrò furniture and dark grey opaque resin floor with polished marble becomes harmonious and comprehensive. The lounge area has been re-configured through demolition of the partitions of the kitchen and living room: the main spaces of the house are now defined by the presence of a large piece of furniture that play an active hierarchal role. Monochrome austerity is rythmically broken off by the addition of green colour, distributed throughout the spaces by the presence of decorative plants, silk curtains and Green Guatemala marble that, together with paintings and design objects, contribute to portray the identity of the interiors. The spaces are characterised by a comforting and serene domestic atmosphere, where the designed space and the furniture formula compose an engaging intimate environment.